BRINGING FOOD FOR GUNSEach one of the naval guns used in France required a train of 15 cars for its maintenance. 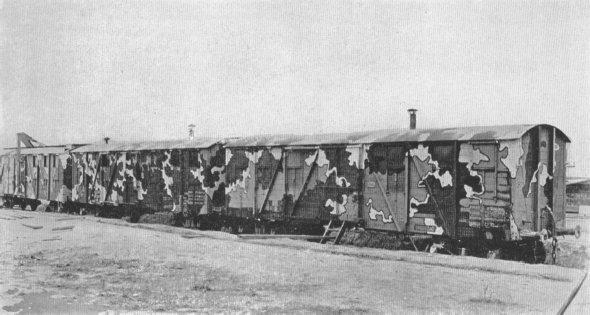 In addition to ammunition cars like those shown here, they required workshop cars, a crane car, berth, kitchen and headquarters cars. 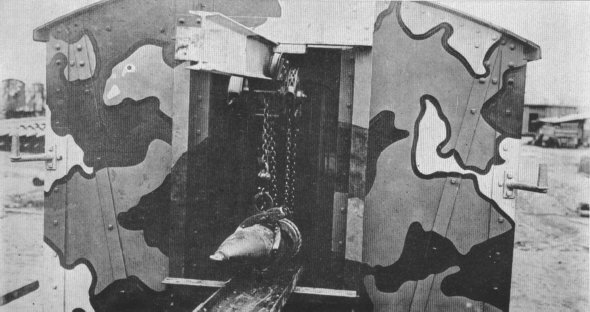 YANKEE INGENUITYShells for the largest long range guns weighed 1400 pounds. By adapting machinery used in manufacturing plants at home for use in ammunition cars, these shells could be handled quickly and easily. Note use of camouflage.